When I was on the Cobb between 1960 and 1970, Pete Larson, the skipper (1959 -1981) used to talk about Jose Franco, who was skipper 1956 -1957. He said that Jose came from the Deep Sea with Joe Dunatov, who remained on the Cobb as boatswain of the deck crew. In those days I was more interested in my job and didn’t pay much attention. Years later, especially talking to Tom Dunatov about his experiences on the Deep Sea, I became fascinated with the history of the two vessels. Grandy Boat Co. of Seattle in 1942, the Prospector official hull number 241334, which was used to continue exploring for king crab around Kodiak Island. His son Lowell became interested in the project and experimented in methods of capturing, processing and preserving and found that frozen king crab had a better quality than canned. By the end of the war and after reviewing the FWS report, he put his ideas into forming a new company in 1946, Deep Sea Trawlers. 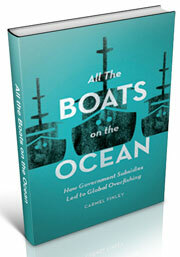 Lowell had radical ideas of the ship to be used to harvest and process the crab. He had a 140 foot vessel built, the design based on the lines of an east coast side trawler that had proven its sea worthiness on the Atlantic Ocean and further strengthened for breaking ice in the Bering Sea. His most radical idea was the internal design of the ship, to process an entire catch of king crab at sea and preserve it by freezing. It was completed, named Deep Sea and sailed on her first trip to the Bering Sea in 1947. 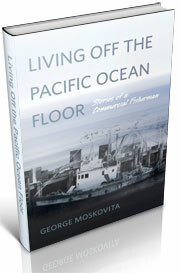 Before the Deep Sea was finished, in 1946 the company chartered the newly refurbished 150 foot trawler Bering Sea. That vessel was formerly a converted mine sweeper used during WWII which had originally been built as a trawler in Savannah, Georgia in 1919. Severe weather was encountered, hampering the operation, and while the vessel was found to be unsuitable for the Bering Sea, fishing potential was good. Lowell Wakefield was on that expedition in charge of the operation and the first mate on this cruise was Jose Franco, who became skipper of the Cobb. 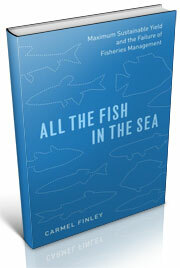 Franco was also an investor in the Deep Sea organization and a well-known fisherman (2). 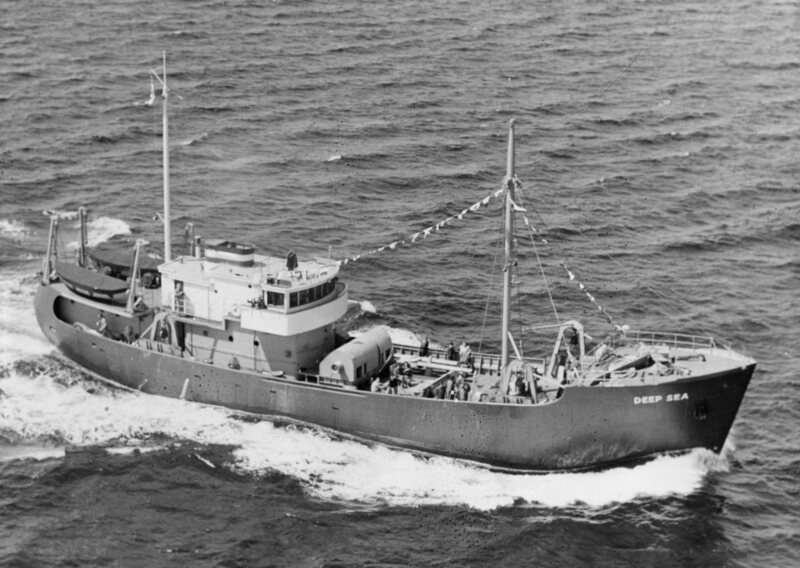 Lowell Wakefield invited a FWS Fisheries Engineer, Boris O. Knake, an expert based at the FWS Technological Laboratory, Boston, Mass., to accompany the Deep Sea on her first voyage in 1947 as a technical adviser. He was invited back for her second trip in 1948 (2). 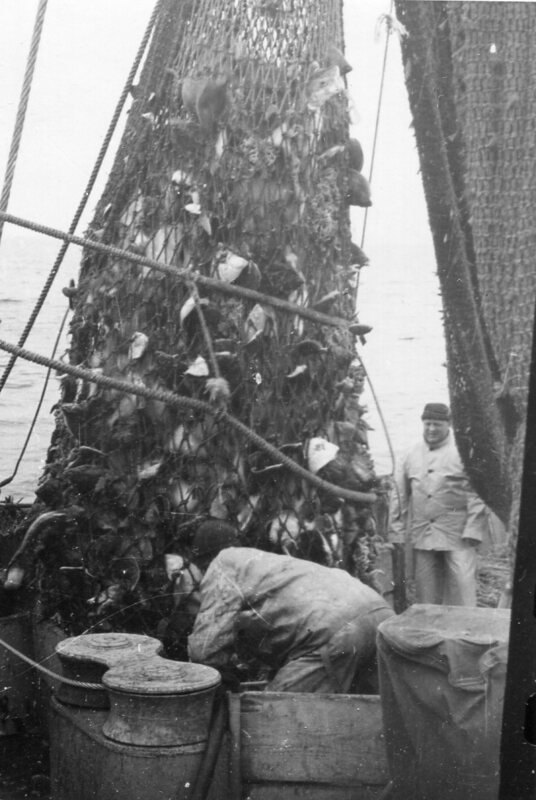 Boris had been skipper of an east coast side trawler, was an expert in trawl nets and had special talent for using pen and ink drawings in his reports. He suggested a number of modifications, one of which was a change in the cod end, and he worked on that with the crew of the Deep Sea before departing on the second trip. King crab are bottom dwellers and when caught in a trawl net they are a dead weight when the net is retrieved. 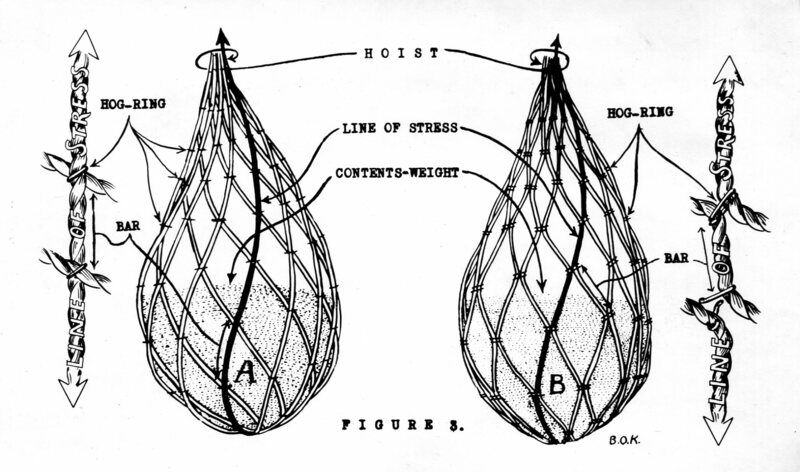 When the heavier crab catch is lifted out of the water the weight increases and the cod end bulges into a balloon shape, stressing the hog ring fasteners keeping the ropes uniformly spaced, which can part, losing the catch. 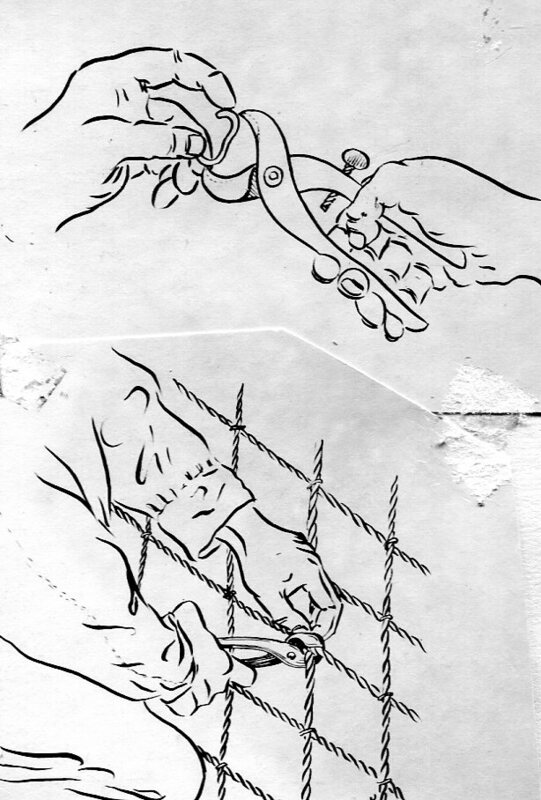 A modified cod end places the strain on the rope instead of the hog ring. of the net. Each one is made on a pegboard where the ropes are strung between pegs. Once all the ropes are strung, each rope is clamped by a hog ring where it crosses another. In my recent discussion with Tom Dunatov he said that his dad had had a cottage business in the basement of his Seattle home for years after Tom arrived in the US from Croatia in 1947. He made panels for the Deep Sea and the company’s trawlers, Shelikof and Foremost, and Tom told me that as a kid, when he and his brothers came home from school, they worked on a peg board in the basement, attach the hog rings where the ropes crossed, and there were 1,081 hog rings per panel. In 1949 the Deep Sea was chartered by the FWS second exploratory cruise and it helped out both organizations. Washington was found to be unsuitable for exploratory work and it was sold and as the Cobb was under construction, there was need for a vessel to continue the work. Deep Sea was available in early summer of 1949 to continue exploration of the Bering Sea where the Washington left off. Don Powell, a new scientist who had been recently hired in the newly formed FWS Seattle office of Exploratory Fishing, was assigned to the charter. I think that that’s where he came into contact with Jose Franco and Joe Dunatov, or at least learned about them so that when he became director of the unit and needed their expertise he could contact them. No wonder Lowell Wakefield thanked Lee Alverson at one of the meetings they attended years later for what FWS had done during the early days when exploratory fishing was important to the country. Fiedler, R. H. & F. F. Johnson, Editors (1942) Report of the Alaska Crab Investigation. U. S. Department of the Interior, Fish and Wildlife Service, Fishery Market News, May 1942 Supplement, Vo. 4, No. 5A. This entry was posted in boat building, Carmel Finley, Dayton Lee Alverson, Environmental History, Exploratory Fishing Base, fisheries science, Fishing, History of Science, History of Technology, Ocean fishing, Pacific Fishing History Project, R/V John N. Cobb, World History and tagged Bering Sea, Bob Hitz, Deep Sea, Deep Sea Trawlers, groundfish, John N. Cobb, Jose Franco, king crab, Lloyd Wakefield, Lowell Wakefield, Pacific Fishery History Project, Prospector, trawling. Bookmark the permalink.